There are many discussions in media about humanity and our roll within the cosmos—discussions which can easily peak the interests of any mindful reader. These subjects of psychology, medicine, and philosophy have a tendency to address issues far beyond the superficial and insubstantial status quo of modern entertainment and confront the very essence of human identity. It is very rare that any aspect of the corporate media would show any interest in matters beyond those of fast food, prescription drugs, and the common-place nonintellectual mental distraction. However, the following article published by the Huffington Post seems to break that trend substantially. We might take note of the fact that this article was originally published on April 1st. Per the typical MSM M.O., Huffington Post appears to have used the date to hide what is actually proving to be a very real concept within the studies of cosmology, physiology, and psychology. Despite the questionable date of publication, there is nothing comical about the profound scientific discoveries which Dr. Deepak Chopra presents in this post. In his discussion, Dr. Chopra addresses the numerous contradictions within the modern scientific establishment and helps to prove the possibilities of universal structure. In his discussion, Dr. Chopra uses verified scientific references to studies completed by mainstream science and helps to prove the tangible relationship between the human brain and natural forms within the universe. Despite the apparent stagnation of the scientific establishment in these matters, observations like those of Dr. Chopra are helping the world understand the universe in ways never thought possible. Menas Kafatos, Ph.D., Fletcher Jones Endowed Professor in Computational Physics, Chapman University. In our previous articles, we challenged a cherished point of view, that reality is material and external. There is a world “out there” that that every baby plops into when it is born. Convincing someone that this didn’t really happen is disturbing, and among scientists, whose worldview depends on the material world being real, hackles are raised as soon as you say otherwise. But we aren’t straying outside science in the quantum era. Our basic point, that the physical world lost its reassuring status a hundred years ago when the quantum revolution began — is beyond dispute. But the fact that every particle in the universe winks in and out of the quantum field, or that particles can transition into waves that spread in all directions doesn’t strike very close to home. Quantum physicists get into their cars every morning with no fear that the engine will vanish into a cloud of energy. But this new, nonmaterial reality actually lies much closer than anyone supposes. The human brain is where the quantum meets the road, with far-reaching implications. What if there is physical evidence that the brain is a quantum device, and that its design reflects the cosmos in an uncanny way that cannot be by chance? In the Vedic tradition of India, it is held that “as is the smallest, so is the greatest. As is the microcosm, so is the macrocosm.” We’re using modern terminology, but the concept is timeless: Nature is coherent from its subtlest level to its grossest. Some clues to this truth are visual — the helix that appears in DNA and in spiral nebulas, for example. Hard science isn’t moved by casual resemblances, however. To tighten the parallels, one can turn to recent work by physicists including Dmitri Krioukov and reported in mainstream journal like Nature’s Scientific Reports. To quote: The “universe may be growing in the same way as a giant brain — with the electrical firing between brain cells ‘mirrored’ by the shape of expanding galaxies.” Looking at simulations of galaxy interconnections in the early universe and neuron interconnections makes it virtually impossible to tell them apart. The brain and the cosmos, like the Internet, are networks, and they evolve the same way. The result, the authors argue, is that the universe really does grow like a brain. In a related article in the prestigious journal Science, researchers have discovered that the connections in the brain are highly organized, the brain’s structure is like a grid of city wiring, the neurons traversing in all directions. The similarities in physical systems can be inexplicable. 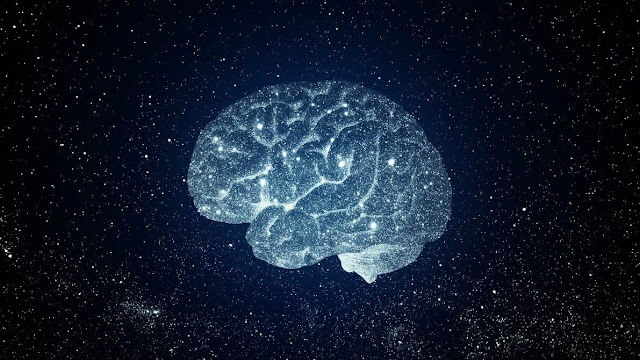 We ourselves noticed that the number of neurons in a brain (about 100 billion) is on the same order of magnitude as the number of trees on the Earth (estimated by NASA to be about 400 billion). In their actual physical appearance, neurons look like trees with a main trunks (axon) and branches (dendrites, which comes from the Greek word “Dendron” or tree). Neurons connect together in a tree-to-tree fashion as their branches nearly touch. The life of a single neuron is as entangled with every other neuron as the trees in a rain forest. The number of synapses in different neurons (neurons come in many varieties) vary from around 1,000, to 200,000 for large Purkinje cells. Trees have branches that show a self-similar pattern from a few hundred to more than 100,000. It’s hard for a neuroscientist to look up at trees and not see even more intricate parallels. Trees receive “information” in the form of carbon dioxide, sunlight, and water to produce the oxygen that sustains life on Earth. Animals in turn produce carbon dioxide, which forms a feedback loop back to trees which are fed by it. In a sense oxygen and carbon dioxide, flowing through every living system, are like neurotransmitters. The synapses where brain activity occurs from neuron to neuron are organized through feedback, with one side feeding chemicals to the other. The fact is that all systems seem to be self-organized, from the complex way that replicant RNA organizes a new strand of DNA to the way the brain produces a single picture of reality that organizes the firing of billions of neurons. The constants that rule the evolution of the universe are so precise that stars are organized to live through definite, orderly stages, and the formation of galaxies from interstellar dust follows its own life cycle. In recent decades it has become established that a single cell is a system, as is the brain, and the entire body — you are presiding over an entire ecology, and like planetary ecology, everything finds a delicate balance. The phenomenon of homeostasis is the body’s way of balancing hundreds of different functions (e.g., blood pressure, body temperature, the symphony of hormones coursing through the blood stream, digestion, respiration, and waking and sleeping). It strikingly mirrors planetary ecology and its living response to forces of balance and imbalance. The Gaia hypothesis, which looks upon the Earth as a single organism, may well apply to our own bodies as cells in the body of the cosmos. “As is the smallest, so is the greatest” has come full circle from ancient wisdom to modern science once we accept that every system is driven by feedback loops, homeostasis, and continuing self-organization. At this point, it is up to dissenters to prove that we aren’t inhabiting a living universe, tied into it by the most fundamental characteristics of biological systems. If it seems too much to grant that the universe is a living organism, that point isn’t necessary. What we wanted to show in this article is that the material world isn’t primary but secondary. Without homeostasis, feedback loops, and self-organization drive every level of Nature — they are invisible and intangible. Without them, the fine-tuned universe couldn’t exist, or the fine-tuned human brain. There are further horizons to cross. Might it be that forests here on Earth are not only responsible for energy generation but also connect planetary consciousness to cosmic consciousness? This may not be just bold speculation. If indeed the universe behaves like a brain, then why wouldn’t it harbor universal consciousness? After all, if the “hardware” looks the same, then the “software” that creates coherence at every level might be the same. Even though everyone uses phrases like “I’m making up my mind” and “My mind’s not very sharp today,” the “my” is only an assumption. The implication is that just as our bodies are cells in the body of the universe, our consciousness is immersed in the universal mind. But how would we go about validating this scientifically? Going beyond resemblances in Nature, systems give us a toehold — studying the evolution of physical systems on Earth will tell us a lot about the evolution of the brain, and vice versa. If the universe is encoded in the brain, then perhaps “insights” that scientists and philosophers have had in the past (breakthrough thoughts about reality) are not be so mysterious. Einstein was astonished that relativity, a theory formulated in his mind, turned out to match Nature’s workings with incredible mathematical precision. Such astonishment has evolved beyond amazement by now. The brain is now being examined in the light of quantum biology, and it is dawning that thinking involves quantum operations at the basis where ions exchange charges — thus exchanging information in a precise, even digital way — down to a finer level where “normal” interactions between particles ceases. People do unexpected, strange, weird, and spooky things — so do quanta. If their weirdness is entangled with ours, there is more than resemblance, parallels, and coincidence. The same source is at work for stars, brains, and thinking. Learn How to Hack Your Brain and Jump-Start Your Awakening Experience with One Question; What Type of Learner Are You?